Hamburg Airport has one thing in common with many airports located close to major European cities: a scarcity of room for expansion. As passenger numbers increase, these airports quickly reach the limits of their capacities. At Hamburg Airport, amd.sigma has demonstrated how user-oriented project development can create more space and minimize traditional project risks. Hamburg Airport has been experiencing an above-average growth for years, ending a record breaking 2017 with above 17 million passengers. But along with the success came an increasing pressure to modernize. In June 2013, amd.sigma took over project development for an administrative office building in which the federal police, state police, and customs officials will be able to work together under one roof, as well as for a multi-functional building to be used by the ground handling services. The existing buildings had been erected in the 1950s and 1960s; they were outdated and ill-suited for modernization. However, there was no space available for new buildings. Moreover, the expansion was required to take place during on-going airport operations and without disrupting flight operations. At the same time, airport management placed great importance on keeping schedule and cost risks associated with the planning, contract awarding, and construction of the buildings to a minimum. The solution lay in a complete reorganization of the site. As a first step, air freight operations were moved to a newer building to free up an area on the former freight forwarding area for expansion. The amd.sigma team then analyzed a number of different alternatives before identifying the optimal locations for the two new buildings. In a second step, a preliminary layout of both buildings was developed, this served as the foundation for an initial cost estimate. Based on this, amd.sigma presented the project concept to the airport's supervisory board. In the core phase of the project, the aim was to determine the specific requirements of the different users and to synchronize these with the building layouts. Which rooms and room functions would be needed? Were there any special safety requirements that needed to be met? What special needs did the employees have for their individual work functions? In an iterative process, all user groups were interviewed several times and were able to contribute their suggestions to the planning process. One of the results of this was the idea of including a fitness studio to promote the physical fitness and well-being of ground handling service staff. Based on the user requirements, amd.sigma then created a detailed room plan that identified all rooms, including their functions, connections, and any special features. This information was transferred to a corresponding BIM building model. On this basis, the team was able to provide a reliable cost estimate. This user-oriented approach has several advantages: the various requirements can be identified at an early stage and then be assessed to determine whether or not they can be accommodated within the existing properties and in compliance with important general regulations, such as fire protection. As all users are involved in the planning process, the result is a much more comprehensive plan which minimizes the risk of additional changes and alterations, and their associated costs. amd.sigma's scope also included developing a strategy for awarding contracts. Together with the purchasing, legal, and real estate departments, the airport management decided to award the construction contract to a general contractor, who would be responsible for preparing all the documents for the building permit and all subsequent planning phases. The functional tender prepared by amd.sigma was formulated in such a way that potential bidders could submit binding tenders that already contained preliminary project planning and drafts for the design of the building facades. The results are impressive: since early 2018, both buildings at Hamburg Airport have been in operation. Goldbeck, the general contractor who was awarded the contract, planned the entire project in just over six months. An important basis for this were the building layouts and requirement assessments that amd.sigma had consulted upon with all users. In close cooperation with the dedicated project manager at Hamburg Airport, who had been a part of the project development and contracting process, the two buildings were erected on schedule, beginning in mid-March 2016, and finishing within a construction period of only fifteen months. The costs remained within the 35-million-euro budget that had been calculated. 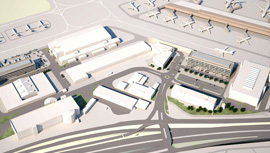 The expansion at Hamburg Airport exemplifies how comprehensive project development leads to maximum planning security. Even under difficult conditions, such as lack of space, a high demand for multi-functionality, or a complicated building structure, this approach helps to avoid cost increases and virtually eliminates scheduling risks. In Hamburg, the combination of up-front project development with subsequent planning and construction by a general contractor was the key to success, and management was happy with the result. Dr. Diana Zitzmann is a Senior Consultant at amd.sigma and has over 15 years of experience as an architect. 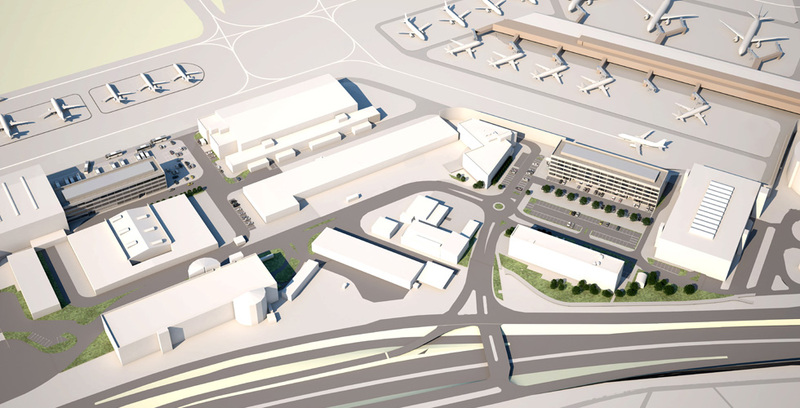 For the two new buildings for Authorities and Ground Handling Services at Hamburg Airport she handled the project development. Oliver Hebeisen works as a partner at amd.sigma. He has 30 years of experience in the planning of complex building projects. Since 2005, he has specialised in airport planning.